Here the kabuki actor Bando Shuka I plays the courtesan Shiraito in the Yoshiwara pleasure district of Edo (Tokyo). The play was first performed in Edo’s Nakamura theatre in 1852. Bando Shuka I was renowned as an onnagata (female role specialist). 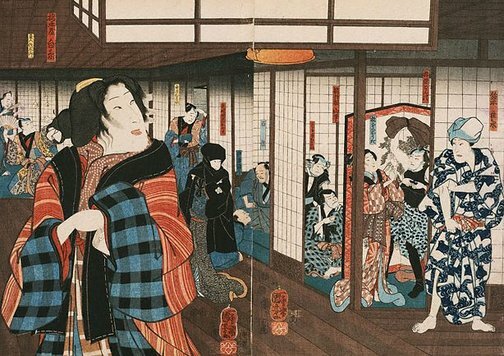 In kabuki, all roles are usually played by men. The scene gives a sense of what a pleasure house of the 1850s may have looked like, and the activities that took place. The man rolling up his sleeves is Suzuki Mondo, a samurai bankrupted by his obsession with Shiraito. The figure in the black hood near the centre may represent Suzuki Mondo’s wife, there to attack Shiraito. Signed [right sheet; part a] l.l. [in cartouche], in Japanese, "Ichiyûsai Kuniyoshi-ga [and artist's red seal]". Signed [left sheet; part b] l.r. [in cartouche], in Japanese, "Ichiyûsai Kuniyoshi-ga [and artist's red seal]".